"I am Moana of Motunui. You will board my boat and restore the heart to Te Fiti." We recently watched Disney's most recent animated film, Moana . Having to follow up the huge success of their last film, Frozen  was always going to be huge ask, but for the most part Moana delivers. 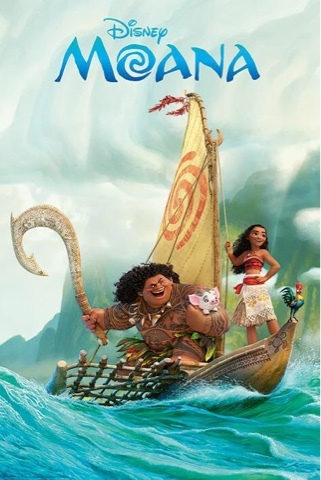 Moana is the story of a Polynesian islands Chieftain's daughter and her trials to get a shape-shifting demigod to help her restore a heart stone back to a powerful island goddess. Ancient legend tells the story of how Maui stole the heart of Te Fiti to give to the human race to allow them to create life, however things didn't work out and the stone was lost to the seas. Back in modern day Motunui, Moana as a toddler is presented with the heart of Te Fiti (island goddess) and she is charged with getting Maui to replace it in it's rightful place. One thing we noticed when watching was how short the cast list was. The standout characters are the titular Moana, heiress to the Motunui tribes settlement and the charismatic demigod Maui, who has the ability to shapeshift through the powers given to him via his magic fishing hook. Moana longs to be an adventurer and explore the surrounding areas of Motunui, to allow the tribe to flourish following recent issues with coconuts being diseased and fish stock running low. As you'd expect from the Disney animation studios the visuals of the film are great, it's hard not to admire the effort that has gone into animating the oceans and the characters hair especially. The detail that has been put into the islands and the supporting cast is immense. Although I didn't really see the value of the Kakamora pirates in the film, there are so many on screen you have to admire the time that must have gone into animating them. The final encounter between Moana, Maui and Te'Ka is great, seeing the water and lava colliding looks immense. I will add that as with most films that have been released for 3D screenings, I can't see how this film would benefit but at least Disney didn't include any gratuitous shots just for 3D. Some of the songs I love, others fall into the background of the film, but the standout songs for me were "You're Welcome" and "Shiny". I'm aware that as a 30-something Dad, I'm probably not the key demographic being targeted by the film, but I feel that these two songs overshadow "How Far I'll Go". I think this was meant to be Moana's "Let It Go", it's a powerful ballad sung by the protagonist of the film, but it's not as a catching as the other two tracks. Overall, I did enjoy the film, but I struggled with why some parts of the film were included, they either felt like filler or an opportunity to show off the studios animation skills. But the films strengths (the animation, visuals and characters) make up for this.